Pak vs Aus 1st ODI 2019 of Pakistan and Australia in UAE 2019 series has been played in Sharjah Cricket Association Stadium Sharjah on 22 March 2019. 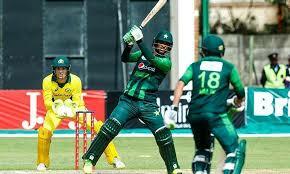 Get Pakistan vs Australia 1st ODI 2019 highlights and live cricket score. Hi friends, I'm Gyan Ranjan. In this post, you'll get Pak vs Aus 1st ODI 2019 live cricket score and full highlights of Pakistan v Australia in UAE 2019 series. Pakistan started the inning to build a big score. But lost the 1st wicket in 9th over when the score of Pakistan was only 35 runs. That was the wicket of Imam-ul Haq. He could score only 17 runs with the help of a boundary and a six. Shan Masood played well and supported with 40 runs before losing his wicket. Haris Sohail and Umar Akmal did a great partnership of 98 runs for Pakistan. Umar Akmal supported the team with valuable 48 runs in this Pak vs Aus 1st ODI 2019.